The Catholic community under the French name of Les Recluses Missionnaires was founded in 1943, in Alberta, Canada. The community offers its members a monastic way of life with perpetual adoration of the Eucharist and an accent on silence and solitude following the example of Jeanne LeBer, a recluse who lived in the early days of Montreal. The monastery is located at the complete East end of Montreal, along the Rivière-des-Prairies, and is surrounded by a regional park. The country setting is favourable to silence and solitude for the sisters and for the guests who benefit of a few days of retreat. The « two windows » of Presence to God and Presence to the world illustrate the spirituality of the Recluse Sisters, as well as the spirituality of the recluse women of Medieval times. Tradition tells us, in fact, that most of these women lived in a small apartment attending a Church. Through one window, the recluse had view on the tabernacle of the Church. The other window allowed the people around to confide their intentions of prayer to the recluse. Thus lived Jeanne Le Ber (1662-1714), who is an inspiration for the Recluse Sisters. 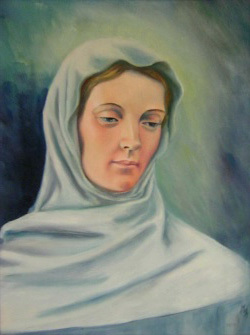 Jeanne, a well-balanced woman, lived in complete seclusion during thirty-four years. Christ present in the Blessed Sacrament was her magnet. In her cell, she embroidered masterpieces, some of which are preserved. Her way of life seems to us today more admirable than imitable. Nevertheless, the spirit which was hers, of eucharistic adoration and intercession for her brothers and sisters, may harmonize with any state of life. Day and night, the Recluse Sisters take turns for adoration in the presence of the Blessed Sacrament exposed in their chapel. The Eucharist celebrated and adored is the core of their life. Their spirituality is one of offering and thanksgiving to the Father, through Jesus, in the Holy Spirit. Morning, midday and evening, the community gathers to pray the Divine Office. This liturgy, mainly composed of Psalms, is the great prayer of the People of God who praises Him and recognize His action in the universe. Prayer of adoration and prayer of intercession (prayer for others) are inseparable. 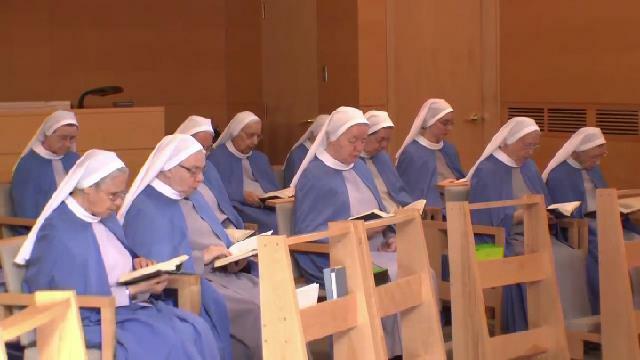 The Recluse Sisters are keenly aware of their double mission of adoration and intercession. They are missionaries mainly through prayer. It is said of the ancient recluse women, though vowed to a strict seclusion, that they hospitalized in their heart the sorrows and joys of all men and women. The Recluse Sisters intend to carry on this tradition. A privileged and concrete way for monasteries to open wide their window of Presence to the world is through hospitality. By reserving rooms or hermitages for guests in their monastery, the Recluse Sisters share with seekers of God the prayerful atmosphere of the house and the beauty of the surroundings. A stay of one or more days at the monastery is always a spiritual experience for a guest whatever the motive: contemplation, rest, study, reflection. Preserving the quietness of the monastery is essential. Therefore is it required that the guest be capable of silence, thus preserving his inward peace and that of others. We offer hospitality to God-seeking people who wish to share the gift of prayer with us in the Liturgy and in silent adoration. Chapel and one meeting room air conditioned. No credit card accepted. We cannot accommodate special diets. Chapel, library, hiking trails, biking and skiing. Autoroute 40 Metropolitaine. From WEST, exit 92, turn left on Gouin, drive 1 km. From EAST, exit 85, Blvd. St-Jean-Baptiste North for 2km, turn right on Gouin, drive 2 km. Between 4:00 p.m. and 6:00 p.m. coming from West, take exit 83 instead of 92, Blvd St-Jean-Baptiste North for 2km, turn right on Gouin, drive 2km. Interested by our contemplative life, see Vocational criterias.